There’s something strange emanating from the galaxy of dirt out there in the Mohave Desert . In the location of Joshua Tree, California , to be exact. The origin seems of alien sound, but of this earth. Terrestrial, yet spacadelic. A mirage of odd characters with leaders armed with weapons of confound sound. Here to stay and make their impact. All reports have been confirmed true: Gram Rabbit has once again arrived! On Saturday, September 18, 2010 , there was a Gram Rabbit sighting at The Port of Los Angeles Lobster Festival. The location was an ocean side port that seemed to be the front line of human existence fighting a losing battle against the salty corrosion of Mother Nature. Gram Rabbit was out of their usual rabbit holes and under the moon lit celestial sphere this evening. The Royal Order of Rabbits were out and crowded with lobster heads and crustacean carcasses of various varieties. The gathering of witnessing inhabitance was immense. When the music started, the humans gravitated like asteroids hurling towards stage. The Gram Rabbit performance was an interesting twist of sight and sound. It was as if Alice fell into a surreal Wonderland of rabbits. Alice turning into female front artist Jesika von Rabbit as she performed among a strangeness of alien rabbits that looked to be conjured up from desert heat delusion s, a Mad Hatter, or an LSD trip: there was the black bug-eyed space cadet rabbit with bubble gun blaster, the white boxer rabbit trying to off heads, and Victorian rabbit dancing disco ball. A wild bunch of fantastical bunnies that stirs among the hop along cowboy dusty bop invaded by spacetronic beats. Jesika von Rabbit had the trance wide-eyes at time as though she had seen the unbelievable, no longer a skeptic of the false reality she realized that now reflects in her lyrics. “Stuck in a native trance, we call buffalo stance.” Freedom to roam, but having imprisoned mind and body. Tom Rutherford on bass, vocalized a few anti-sentiments as well. Ethan Allen, the lone stranger on guitar. Hayden Scott on drums. 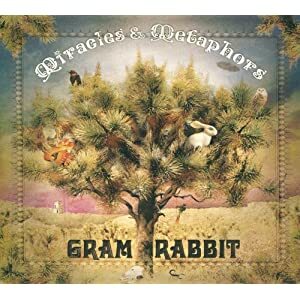 “Miracles & Metaphors” is the new album from Gram Rabbit that is set to be released October 12th. Copies are currently only being sold at live shows, but a few tracks can be heard on their MySpace page. The following is their live Lobster Fest show finale performance of their new spaced-out, bunny infected, desert dedicated, party themed song, “Candy Flip”.